This Bellaterra Home bathroom vanity with sleek design, will bring refreshing look to any bathroom. The recessed sides of the cabinet makes this unit more interesting. It has 4 functional drawers and 2 door panel with a interior self. Solid hardware in brush nickel finish, installed with top quality soft-closing hinges and full extension drawer glides. The bottom oversize drawers have a interior tray which make storing small items much easier.Constructed with a sturdy solid wood frame, it is built to last for years. Faucet and mirror not included. Professional installation recommeneded. Faucet and mirror not included. The ultimate mix and match vanities. 4 simple, yet elegant vanity styles and 1 bridge unit combined with a variety of finishes, drawers, and countertops offer the best in customization so you can find the perfect look for your bathroom. Combine a vanity with two bridges for extra counter space, or two vanities with one bridge for a double vanity with your personal touch the combinations are nearly endless! Solid wood and veneer over plywood construction with soft-closing hinges on our doors, and full-extension ball bearing drawer glides. Faucet and mirror not included. Professional installation recommended. The ultimate mix and match vanities. 4 simple, yet elegant vanity styles and 1 bridge unit combined with a variety of finishes, drawers, and countertops offer the best in customization so you can find the perfect look for your bathroom. Combine a vanity with two bridges for extra counter space, or two vanities with one bridge for a double vanity with your personal touch the combinations are nearly endless! Solid wood and veneer over plywood construction with soft-closing hinges on our doors, and full-extension ball bearing drawer glides. Faucet and mirror not included. Professional installation recommeneded. 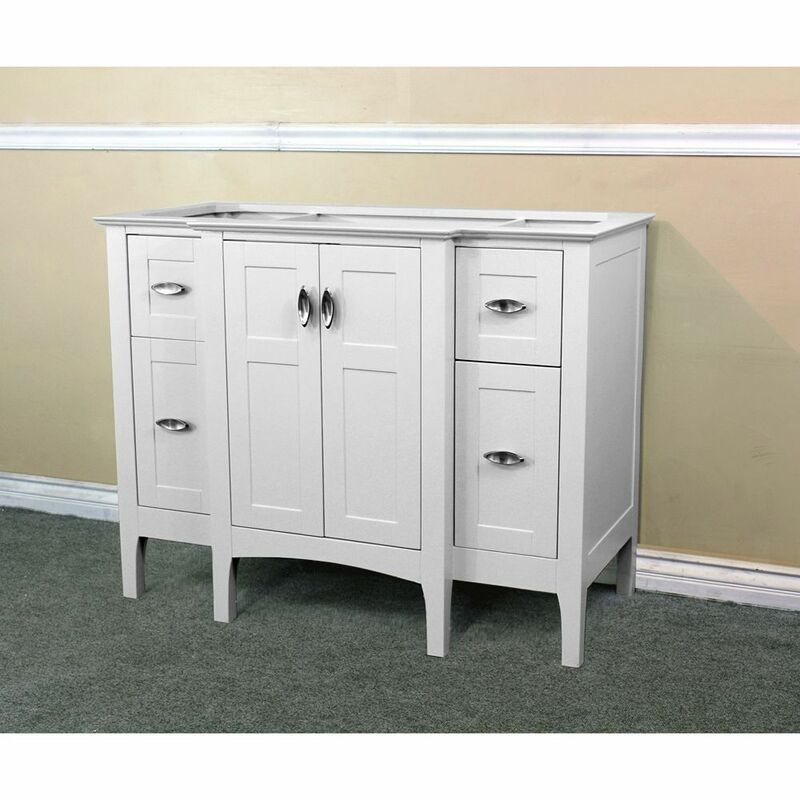 44-Inch W Single Sink Vanity Cabinet Only in White This Bellaterra Home bathroom vanity with sleek design, will bring refreshing look to any bathroom. The recessed sides of the cabinet makes this unit more interesting. It has 4 functional drawers and 2 door panel with a interior self. Solid hardware in brush nickel finish, installed with top quality soft-closing hinges and full extension drawer glides. The bottom oversize drawers have a interior tray which make storing small items much easier.Constructed with a sturdy solid wood frame, it is built to last for years. Faucet and mirror not included. Professional installation recommeneded.